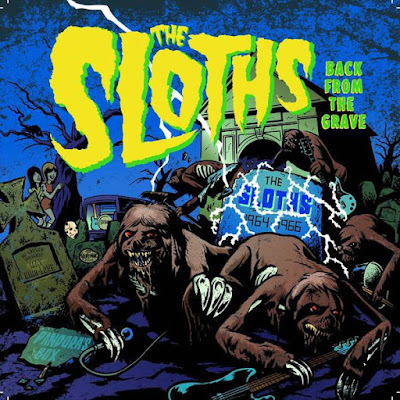 THE B-MOVIE NEWS VAULT: Sometimes They Come Back: 60s band "The Sloths" are "Back from the Grave!" Sometimes They Come Back: 60s band "The Sloths" are "Back from the Grave!" I got this cool tip a little while ago from B.C. BUTCHER director Kansas Bowling, and thought I'd share with you my faithful Vault Dwellers! Recently a garage band from the 60s called "The Sloths" has gotten back together. Though two of the original members have passed, they're vacant spots have been filled, and now this long forgotten band has cut a new album, and is currently on tour! So why is this newsworthy you may be wondering? Because lead vocalist Tom McLoughlin, wrote and directed FRIDAY THE 13TH PART VI: JASON LIVES! (He also directed ONE DARK NIGHT, DATE WITH AN ANGEL, and STEPHEN KING'S SOMETIMES THEY COME BACK!) It's cool enough that a group of old friends have reunited to take a second crack at being musicians, but it's even cooler knowing that they're fronted by the guy who reinvigorated the FRIDAY THE 13TH franchise! I've sampled a few tracks from "The Sloths" and I kind of dig 'em. Feel free to check out their new album (Back From the Grave) below, as well as their cool music video for their song, "One Way Out!" Keep us updated and we want to see them again!